Last Friday, the SEO world was sent into a frenzy. Webpages from all over the globe, of every type, from every industry, were suddenly and mysteriously de-indexed by Google. They had simply vanished from the search engine. In some cases, it was whole sites. In others, it was a page or two. On forums, blogs, Twitter, Facebook, and all around the LinkNow Media office, we all cried out in unison: WHAT HAPPENED? Who Was Affected by the Indexing Bug? From all our current information, websites of all type and from every corner of the globe were affected. There doesn’t appear to have been any reason behind it. There was speculation that it affected sites which had been helped by the March core update. But no one could confirm this. As far as we can tell, it was random. Moreover, according to Google, there’s no way to accurately estimate the number of sites affected. But a study my Moz suggests that the number of affected sites was as high as 4% of all sites indexed by Google. And while that’s a big number, it’s important to remember that Moz can only view a small percentage of sites in the Google index. Based on their information, 4% seems to be the number that everyone is currently agreeing with. 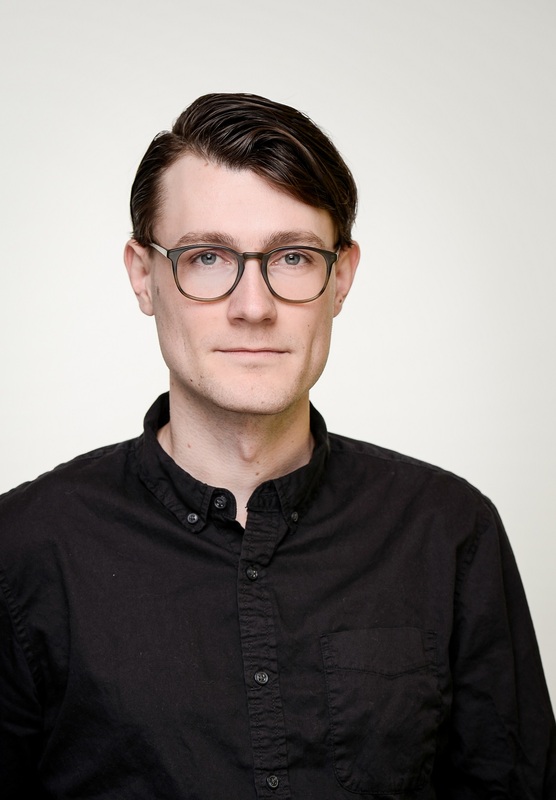 If you’re a LinkNow Media client and you’re worried that you might be part of the 4%—don’t worry! We’re monitoring all our sites very closely. If your site was affected by the bug, we’re on it. And we’re currently in the process of resubmitting the affected sites to Google’s Index. What Did Google Say About the Indexing Bug? Unfortunately, this was a little preemptive. 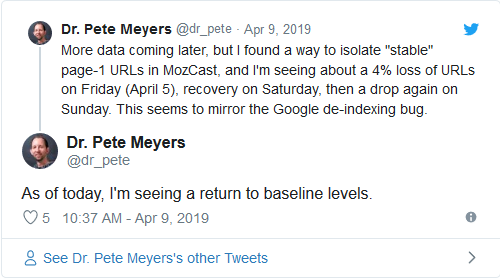 By Sunday morning SEOs were again saying that there was still a problem. Google admitted that it wasn’t fixed. They were still working on it. All they would say was that a number of sites had been affected by the bug. The affected sites were de-indexed. Meaning that they were not longer registered in the index of searchable sites on Google. 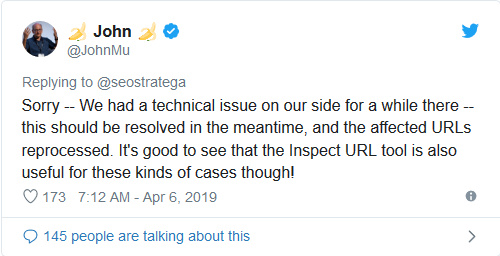 As you’ll see above in John’s Tweet, they did provide a quick solution: use the Inspect URL tool to submit specific URLs to be re-indexed. Not a bad plan for a few important pages. But, as you might imagine, that would be a rather time-consuming job for sites with hundreds or thousands of pages. Did Google Fix the Indexing Bug? What Happens Next? By mid-week, things seem to have stabilized. And by Wednesday the 10th of April, Google had fixed the bug. However, that doesn’t mean that every page has been automatically re-indexed by Google. It simply means that the de-indexed pages can be re-added into the index. And unfortunately, there’s not much to be done at this moment. We just have to wait for Google’s crawlers to comb over the pages that need to be re-indexed or re-submit them, page by page, manually. As mentioned above, we here at LinkNow Media are working hard submitting our client’s pages to be re-indexed. And things are looking up! 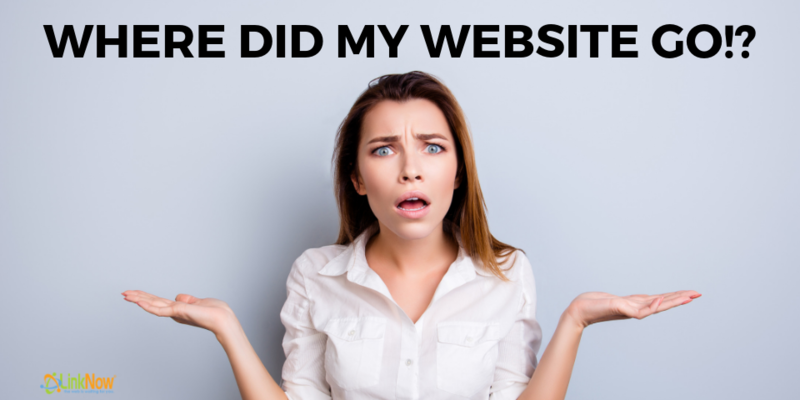 If you have any questions or concerns about your website, get in touch with the LinkNow Media SEO experts by calling 1.888.667.7186. Let’s get ranking—the web is waiting for you!